Kenya would eat an entire jar of homemade cranberry sauce on its own if given the chance -- he actually tried to do it once last year when I wasn't looking. I didn't have to worry about him getting his share of antioxidants for a while because he basically got a month's worth in that one sitting. 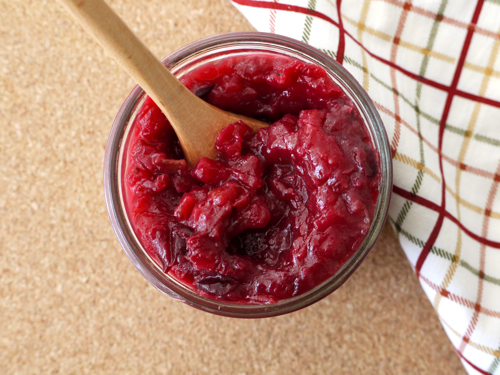 When I was growing up, my mother always used to make a cranberry dish for Thanksgiving. This is my twist on her recipe which includes bite-sized pieces of celery, apple and onions. With grated apple to give extra texture and a whole cinnamon stick for added flavor, my little guy has had sights on this new cranberry creation from the moment I started working on it. I am happy to report that Kenya would happily eat this Cranberry Apple Chutney all on its own with relish (get it? Chutney? With relish? ), but with all the turkey testing I've been doing recently, he's been enjoying it the way I intended_ alongside a nice slice of turkey. Check out the links below for more holiday side dishes! Looks really yummy! I wouldn't have thought of the onion and celery either, but I'll have to give it a try. I bet it's delicious with turkey. I was assigned to bring cranberry sauce for my toddler's class Harvest Feast today, so I made up a cranberry apple sauce (I didn't want to serve them the cups of sugar that are in the usual cranberry sauce). I used 10 honeycrisp apples (another sweet variety would work too), 2 cups fresh (or frozen, I tried it both ways) cranberries, 1/4 cup apple cider, 1/4 cup real maple syrup and 1/2 teaspoon ground cinnamon - let that simmer away on the stove and mash. It's delicious, and my little guy can't get enough of it! sounds yummy! i'm going to try this for thanksgiving dinner! YUM!! I'm totally trying that combo. Thanks for the great idea! No liquid at all? My older daughter's favorite dish is my cranberry/apple sauce but I always use about a cup of liquid (orange juice or apple cider). Yours looks much thicker which would be preferred but I am curious on the cranberries cooking and \"popping\" without the liquid. Also, do you mash it up quite a bit before serving? Do you list these recipes under age categories? I will be starting my 5 month old on food next month and would love to know which recipes I can start out with. Here's a list of recipes that are perfect for new eaters. http://b12.ba4.myftpupload.com/category/recipes-6-9-months/ I would start with single fruits and veggies and then once your baby has tried a few things you can mix them together. What a fun time, enjoy and feel free to ask any questions! I want a free Macbook Pro and I only want to give out my address for them to ship it to. I dont want to give out much else. I just made this and it is really good!! I am not really a cranberry fan, either. I halfed the recipe, as I only had 7oz. of cranberries. I did add a splash of water halfway because it was sticking to my stainless pan, but prob wasn't necessary. Love this, thanks for the great recipe!! I made it for Thanksgiving and it was delicious!!!!! I made it for Thanksgiving as well and 100% agree - so yummy! After Thanksgiving a local grocery store was clearing out their cranberries for 50 cents a bag. I bought 2 bags and made this recipe (3/4 c. sugar was sweet enough for us) with one and froze the other. My husband and I LOVE this sauce served with salmon. I just took out the frozen cranberries and made another batch. If I had realized how delicious and easy this was, I would have bought more cranberries!